Great Food, Great Drinks, Great company! 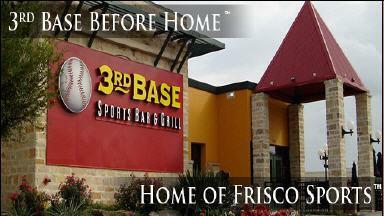 At 3rd base you can find first class entertainment space for fans of all types of sports, from football, baseball, basketball, hockey, soccer, golf, and others-to be enjoyed on our 30 42-inch HD LCD and 110-inch HD-projection TVs. Join us daily for lunch, check out our daily specials. Our large diamond-shaped bar is perfect for meeting friends and colleagues after work during our daily happy hours, just kicking back and cheering your team on the HDTV screens, or celebrating after the local Frisco team games. The Party-Room is perfect for our corporate meetings, birthday or anniversary parties, team parties, or for whatever reason you want to get together! It can hold 50 people comfortably, and leads out to our beautiful Patio. Join us to cheer your favorite teams, unwind during Happy Hour after work and hang out on Wednesdays for "Girls Night Out."